We all know our computers aren't going to last forever -- well ... they aren't, you know! -- and at some point we will have to actually buy a new machine and somehow see to it that all of our data, our documents, photos, spreadsheets, Quicken files, all that stuff, will get onto that new computer. Some of us may even know some way to do that. Some of us will copy stuff to USB Flash Drives, and some will copy data over a network, but how will we get our programs, our logins and passwords, our license info, all of our browser cookies, you know, all of the stuff that makes our computers OUR Computers? Windows Easy Transfer which is free from Microsoft, and which you already have on your Vista and later computer (and which you can get at the link for WET above for XP) will copy non-binary data, files and photos and that stuff, even some passwords, logins and cookies, but it will not move your programs and license info over. That's not the worst thing in the world, if you have all of your install disks, CDs and DVDs, with Product Keys and Serial Numbers. You can just reinstall the programs, Microsoft Office, Quicken, Photoshop, and all of that stuff. But what if you don't have those install disks? And even worse, what if you don't have a working computer to copy the data from? What if the only thing you have left is a -- hopefully -- working drive from an old dead computer? Well I have a Program For You that only costs 40 bucks, and will save your bacon. Laplink Software makes a series of programs called PC Mover, amongst which is a version called PC Mover Image Assistant. With Image Assistant you can copy all of the Programs, Personal Info, Data, Logins, Passwords and whatever else you want and Image Assistant will install them onto your new computer just as if you yourself had installed them onto your new machine. And there are other versions of PC Mover that will upgrade you from a live and working PC or in place, say, from Vista 32 to Win 7 64, which just upgrading Windows will NOT allow you to do. There are just a couple of catches. First, for Image Assistant you have to be able to physically connect the old drive to the new computer, which may mean physically removing it from the old machine and connecting it to the new one. So you have to know how to open up a computer and you have to be comfortable disconnecting and reconnecting the data and power cables to the drive. Are you? The 2nd catch is that you have to know what you want to move from the old computer to the new computer -- it sounds simple I know, but you'd be surprised how much stuff Image Assistant will offer to move for you. One word of advice -- only copy what you know you want and need. You can always come back later for something you missed, and you certainly don't want to copy stuff that will get in the way of machine-specific programs already on the new computer! Of course, if your computer has died and your hard drive has, too, I know you are STILL OK ... because, you've backed up your computer to a mirror. I am sure you have. Yes??? Great! You can use PC Mover on that. PS You do not know how to open up your computer or how to disconnect and reconnect cables. Sad. OK, stay tuned. The next article will discuss just that. Check back next week. PPS If you just have an archive backup and not a mirror backup, you can restore your data to a new and different machine, but not your programs, your system files, or your registry. Make a mirror backup. Do remember, any of you who want to subscribe to the Working Computers Blog, just go the right hand side of the page and look for the "Enter Your Email Address" box and click on "Subscribe", or click on the "Subscribe in a Reader" icon. The first choice will get you the once a week articles on computer use and maintenance problems you face as a home or small business user. The 2nd will allow you to see the articles in your RSS reader -- if you do not know what that is, make the First Choice!Use links following this article to download any software discussed, including all of the cloning software, freeware and commercial, and iDrive and Dropbox. Or see the previous article.There is even a bonus slide on installing to a new computer that is very different from your old computer by using Laplink's PC Mover Image Assistant. View more presentations from Ted Whittemore. Don't Just Be a User! Take Care of that Relationship! With Your Computer! 1) How to be Rebooted and Back in Business in minutes after a system drive failure. 2) What is the difference between an Archive backup and a Mirror backup and why you should care. Hint: One boots the computer and the other ... doesn't. They are all good and can do the basic cloning task -- some offer more and some have limitations -- I encourage those of you who are interested to try them out. I will also talk about some commercial software that is not free, and why I still think it is a good value, in this case: Casper 7.0. There are commercial versions of most of the free software listed above as well and may offer those of you who care features (and support) you are willing to pay for. We will then take a look at some of the free and up-to-5 GB On-Line Backup Services available that can protect your critical data with unattended backup off-site -- such as iDrive and Mozy. And another cool file protection and sharing service that's free -- Dropbox. 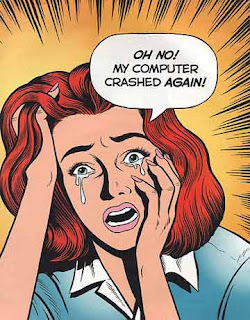 So if you worry about what will happen if your computer's hard drive dies, and how you will get back in business, come on by the library Thursday night, at 7 PM, Feb 16, and find out. 2) What is the best Free On-Line Backup? Note: The Coupon Code Deals Have Expired for these 2 HP Laptops. Sorry. I'll let you know when they are back! I've gotten some emails pestering, er ... asking me what are the best Laptop computers to buy right now, and the interesting thing is the 2 machines I am going to recommend have been showing up with unadvertised Coupon Codes for some months now, and they are REALLY the best deals around. You can get more expensive machines, but not much more powerful ones, and they are, the HP dv7tqe and dv6tqe laptops. Remember, Power equals Longevity. With the rapidly increasing demands that the internet, networking, and bigger and more CPU-intensive apps place on computers, it doesn't take long for today's mid-range PC to become tomorrow's obsolete turtle of a computer. Luckily the dv7tqe, and its sibling the dv6tqe will last for a good long time. You could pay a little less, but you'd get a lot less. OK, to the discounted computers: The HP dv7tqe and dv6tqe laptops differ primarily in that the 7 has a 17" screen and the 6, a 15.6" screen. Either can be upgrade from the standard 720P screen to a 1080P full HD display. They are, after discount, with free delivery, but not including tax, $600 and $700 respectively. Inside they are nearly the same computer with the Intel 2nd Generation Quad Core I7-2620M 8 thread CPU, 8GB of RAM, USB 3, WiFi N and Win7 Home Premium. which you need to enter at checkout to get the $450 discount. These deals are for a few days only and can disappear at any time, but ... may reappear just as suddenly. Who can tell? Still they are great deals for great machines. Either one you choose you can't go wrong. These deals come to you courtesy of TechBargains. Check them out; they do have great unadvertised deals.